A Peek at my week. 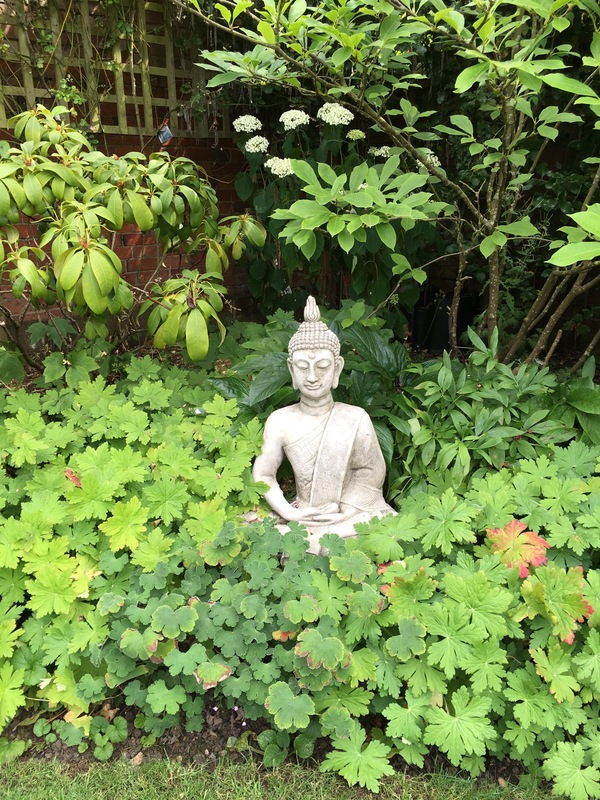 What I’ve seen, where I’ve been…. 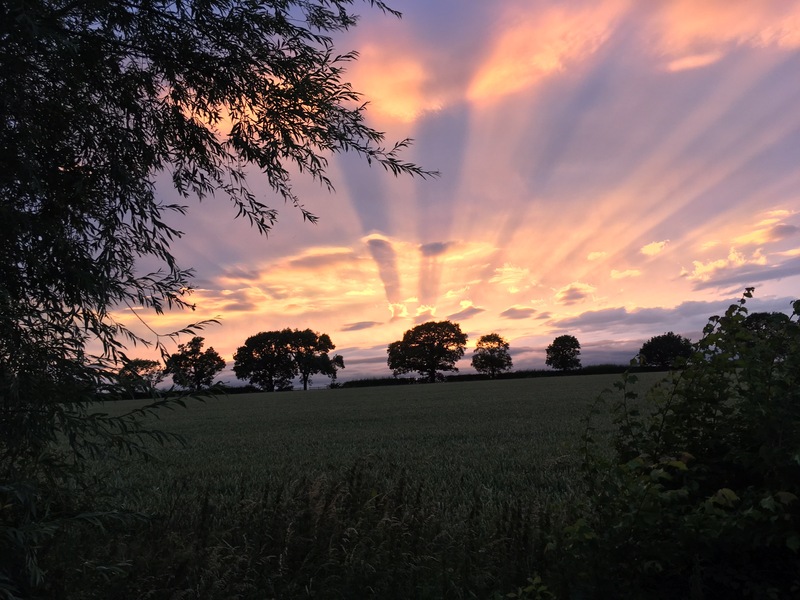 This glorious sunset from the lane where I live. We can see these trees from our field gate. 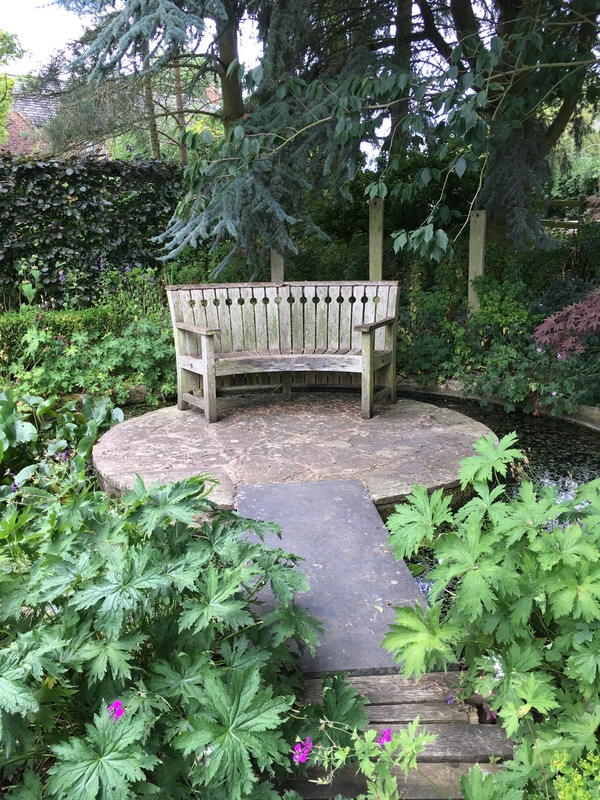 VISITED some fabulous gardens at Smeeton Westerby near Market Harborough, open in aid of GEMS Charity. GEMS was founded in June 2012 by Sally and Andy Anderson after they had accompanied four close friends on weekly visits to the Osbourne Chemotherapy Suite at Leicester Royal Infirmary. Inspired by the hard work and dedication of the nurses, and the courage of their four friends, they set out to raise funds to make patients and supporters more comfortable during their treatment. The funds have been used to buy specialist treatment chairs and refurbishing the waiting room. This is the view from one of the open gardens, Highfields. Green undulating countryside in the distance. Chocolate box thatched cottage, overlooking the allotments in the village. 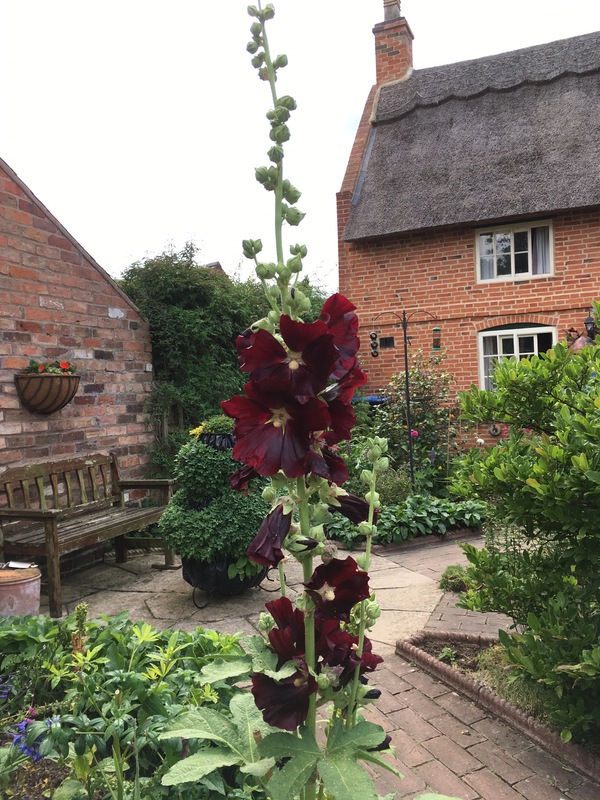 Full of colourful plants including this wine-coloured hollyhock. Mooched around the allotments. Got lots of ideas for companion planting. 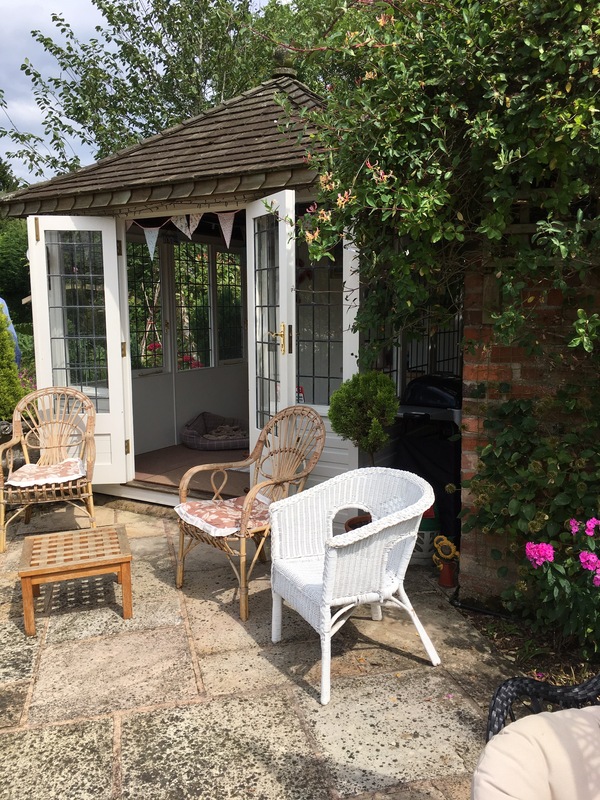 Mum and I sat in this pretty summerhouse, enjoying the peaceful scene. Sat on a bench encircled by water, under a shady tree. Heavenly. 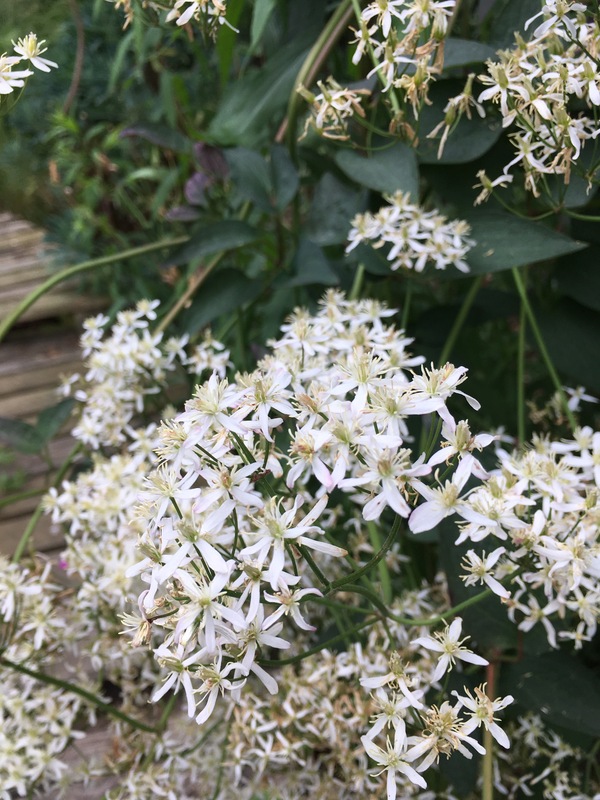 Saw this beautiful late summer-flowering Clematis recta. A floppy, sprawling variety which looks good amongst perennials and wild flowers. Bees love it too. Laughed at this cheerful sight. 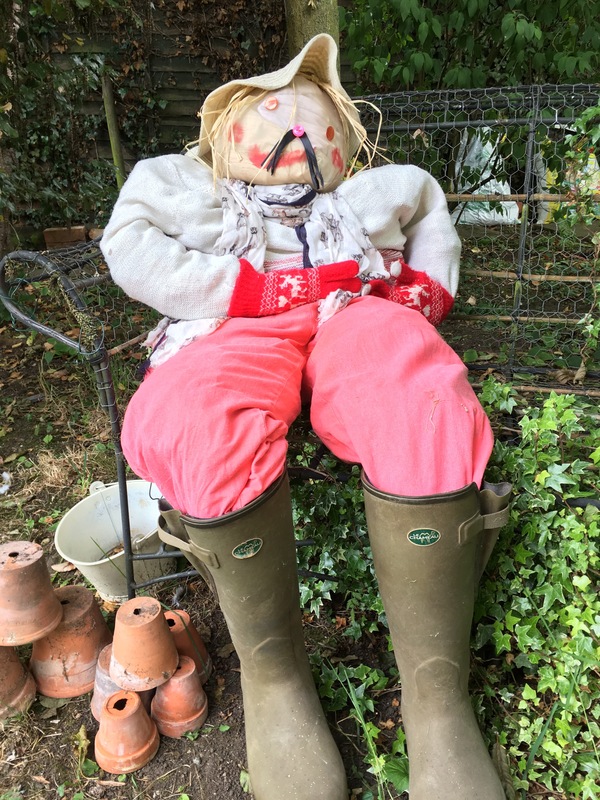 Even the scarecrows in Smeeton Westerby are posh. This one is wearing Le Chameau welly boots! 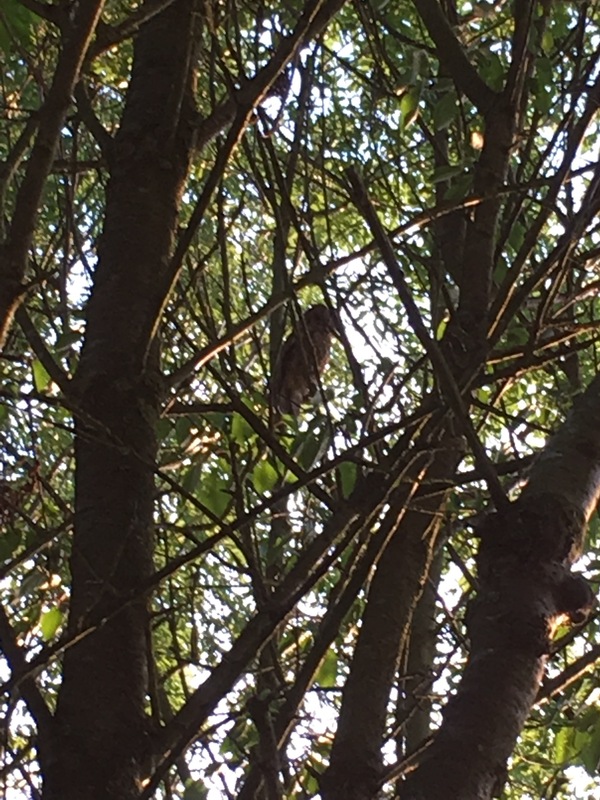 Back home to spot two fledgling tawny owls in the wild garden. Made our day to find them in the cherry trees around the horseshoe pond. Watched them until dusk as they bumbled from one branch to another, flexing unfamiliar wings. Thank you Wendy. That sunset lasted for ages. We are really appreciating the light evenings. I’m gardening till 9pm still here. Thanks for reading. All the best. Your photos are so lovely and inspiring. I like how you focus in on ‘the extraordinary’ in the ordinary around the every day. So important to appreciate what most of us have all around us. Love the gardening ideas too!! Thank you for reading. That’s true. I do appreciate absolutely everything around me. Gardens, nature and gardening people are wonderful. Thanks again for taking the time to reply. My favorite was the bench under a tree, surrounded by water. Lovely. We spent a very happy 20 minutes sitting chatting there. Surrounded by dragonflies from the moat and butterflies from the wildflowers. Looks like a delightful interlude. A nice post and lovely pictures, especially the first one. It looks and sounds like you had a most enjoyable week. Kathy wonderful sunset. GEMIS charity is a magnificent association. Highfields is beautiful and the wonderful photos: the bench surrounded by water a great place to rest and relax. I love everything Kathy. Greetings from Margarita. Such fun looking at other people’s gardens. 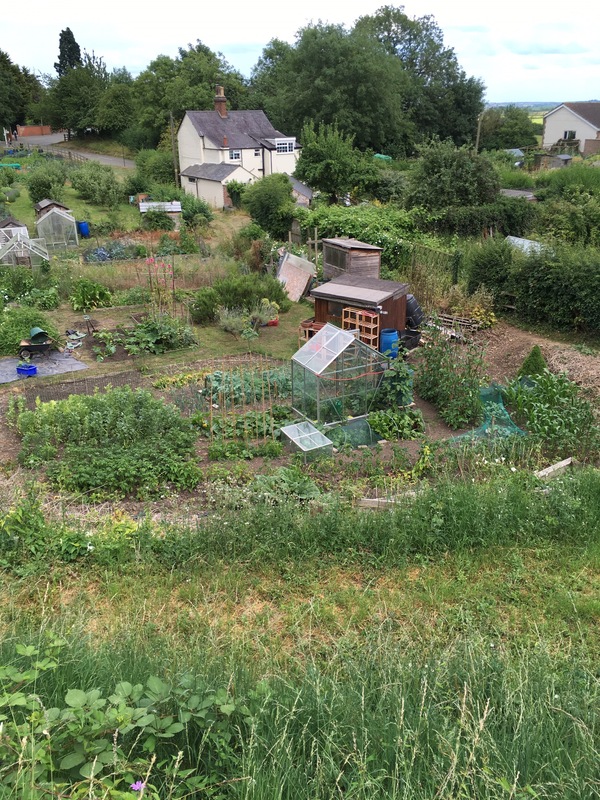 And I always enjoy allotments. Beautiful gardens and all for a good cause, you couldn’t be luckier! Love the photos and looks like you found a few treasures there. How nice o see the owlets as well. How long are you in Norfolk? 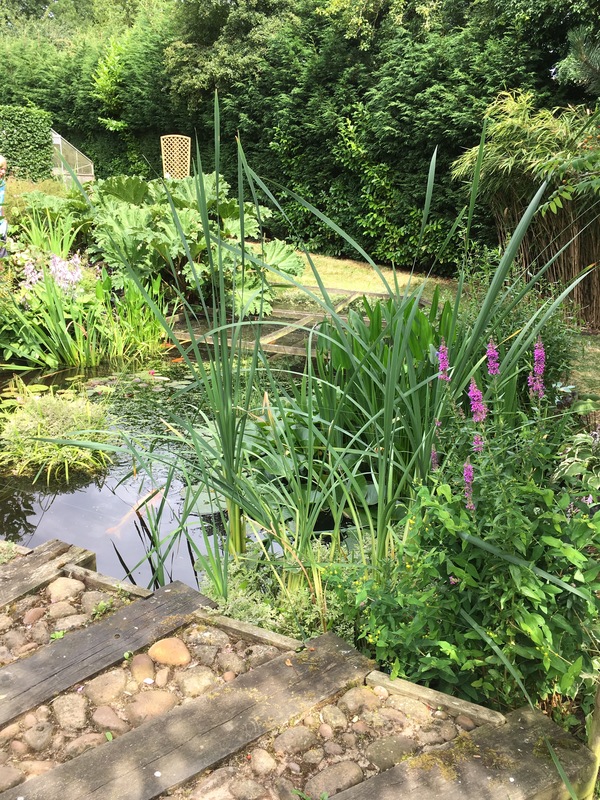 Have you been to East Ruston Old Vicarage garden? It’s a must, if you can get there. 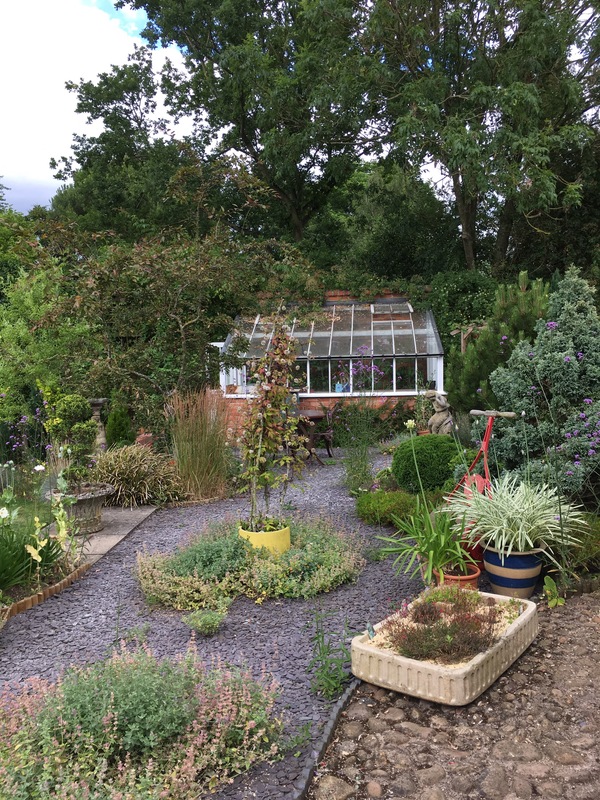 Love the sunset and the open gardens – we have been trying to catch up on visiting other gardens now we are ‘done’ for the year! J >Very picturesque, and interesting too, your excursion – thank you. There’s something I find about such places that makes me feel very uncomfortable: I suppose it’s the way what were ordinary working villages have become monopolized by wealth and privilege. 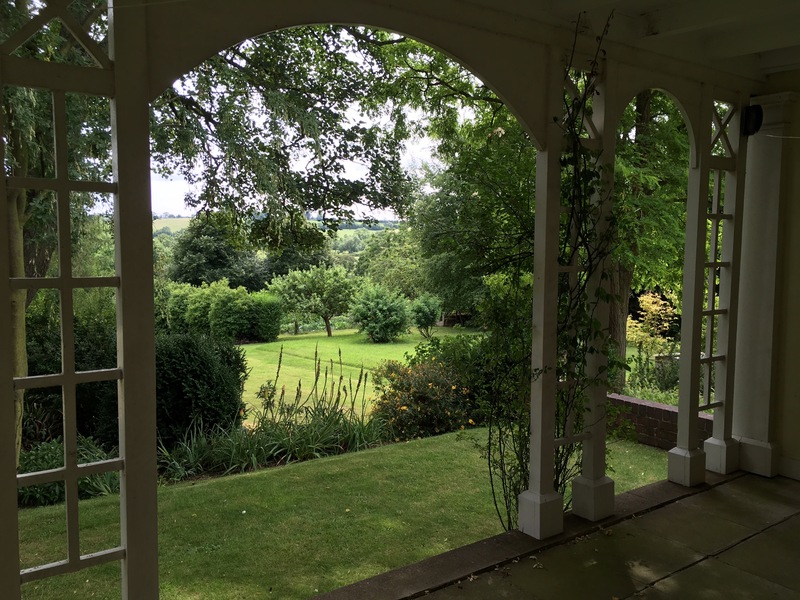 It looks the classic English idyll, but in reality is way out of the reach of ordinary people of average means, who are at liberty to wander and look – but cannot take part. I think that feeling of exclusion was a big driver in moving to the Outer Hebrides, where the countryside is still in the hands of the peasants (no-one of means seems to want to live here permanently – though they’ll spend £1m building an eco-house by the shore). Here we do have the freedom to shape the landscape according to our own ideas – though the extreme weather makes it a quite different proposition to these idyllic English villages.